See Insubordination with DCDR, Tenafly Vipers and Outer Stylie 6/18 at O'Brien's Pub. 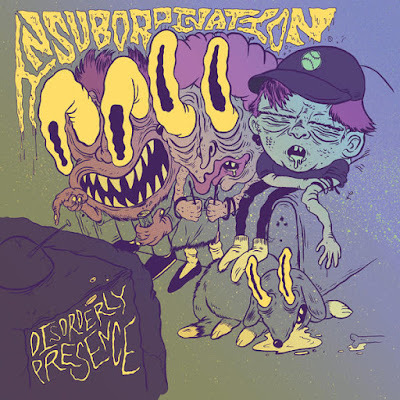 In a way, the title of Insubordination's new album, 'Disorderly Presence' (Angry Pirate Records), could accurately describe not their place in modern society but in the punk rock community as well. For one thing, the three-piece punk band hails from Richmond, VA, not exactly the first city that comes to mind when you think of punk, especially considering the hub of one of the most influential scenes in the genre is only two hours north. But the band also defies order in that their music keeps itself at an arms length away from most bare-bones punk groups that have come out of the decade so far. "At their best, Insubordination are story-tellers, set to a soundtrack of some of the most original skate punk that I personally have heard in a long time." At first listen, what will hook a listener in is the pleasant sound of a good old fashion power trio, a sound that will make punk fans nostalgic for bands like Hüsker Dü and Jawbreaker. This particular album kicks off with, arguably, their strongest track on the record. “Pit Stains and Migraines” is nothing less than a flurry of noise to consummate the skate punk genre; a perfect storm of thundering drums, bubbling bass lines, and a swirling guitar melody to introduce a band (figuratively and literally) of delivery workers who are living double lives as musicians. What struck me as particularly unique about this album was the band's impressive story-telling ability. Singer/guitarist Scott Trinca absorbs the listener into the band's personal stories about drug-abusing friends (“Toast Is Toast”, “Cheese Merchant”), the dead end existence of their hometown (“Where We're From”, “Predetermined Town”) and a love song for punks, young and old (“Here's to the Punks”). Of course, some of the story-telling doesn't rely solely on its lyrics to provide a narrative. “Two Weeks to Tour”, the band's ode to going out the road, starts out as with uninhibited, almost comical verses celebrating the anticipation of the moment they take off for the first town. Suddenly, the band descends into a hard-rocking instrumental break, with chords being thrown around into a sonic mess of cymbals and the bouncing snare drum. The breakdown almost represents the unspoken frustrations and temper that come with the bad times on tour. This is a song I'd love to hear at the last show of their grueling six month tour, which started in June. Granted, the band does have a couple of songs that follow the cheesy “us-against-them” mentality, presumably as a tease to get a few cheap points of punk credibility with its audience, almost like dangling a carrot in front of a donkey to get it to move, But what these guys lack in statements, they certainly make up for in humor. The moment you hear the songs “Yell Scream Juice” and “Rum and Coke”, you almost have to laugh to yourself at the instant image of dozens of punks chanting the tongue-in-cheek lyrics; the former, a power-pop tribute to an alcoholic father; the latter, a celebration of the remedy it previously railed against. At their best, Insubordination are story-tellers, set to a soundtrack of some of the most original skate punk that I personally have heard in a long time. If they can help steering in that direction as opposed to down the already well-bulldozed “Fat Cow” path, the songs could have more of a repeatable factor for more than just the sheer energy, but for the details of the tale it's trying to tell. Regardless, 'Disorderly Presence' will be, without a doubt, a landmark in the band's career as the record that found clues in its search for identity. Insubordination will be playing Night #3 of DCDR's O'Brien's Pub take over in Allston with the Tenafly Vipers and Outer Stylie tonight, June 18th. 8PM / $8 / 21+ (Facebook event details). Grab 'Disorderly Presence' on iTunes now. Austin Sorette is a freelance music journalist writing for Boston area blogs including Boston Ska (dot) Net. Holla at him.